$132 Bi Weekly Tax Inc.
Small on towing, Large on value! 2 Double bed bunks in rear and outdoor kitchen. This Aspen Trail travel trailer is perfect for a couple that enjoys their own space or likes to invite the grandkids to tag along. Just imagine drinking your morning cup of coffee at the U-shaped dinette while looking out the windows after waking up the grandkids to go play outdoors. You might even start thinking about your plans for the day which might include a walk, hike, or bike ride. 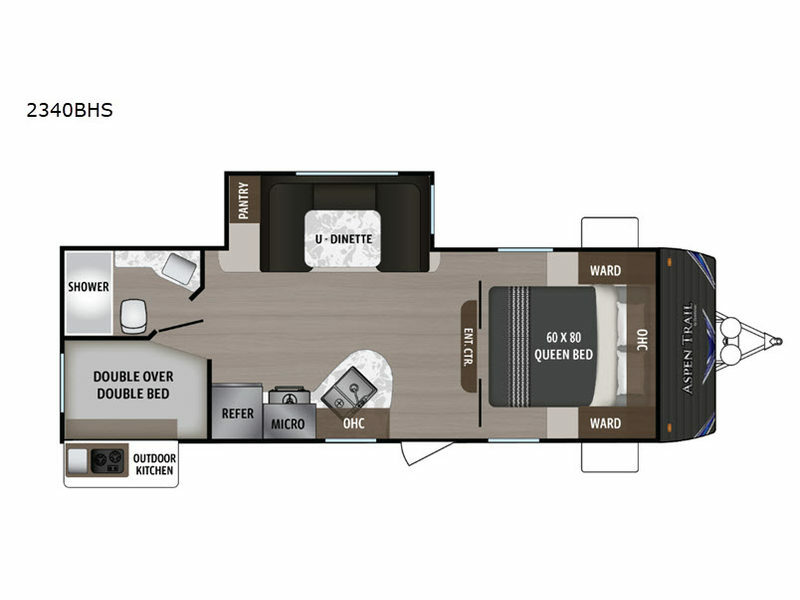 This model allows you to sleep in your own private bedroom, make meals inside or outside with the outdoor kitchen, and get washed up in a full bathroom. It's time to take a look and see what all you have been missing! With each Aspen Trail travel trailer by Dutchmen RV you can travel during any season thanks to the heated and enclosed underbelly, and you will find the mega exterior pass-through storage quite handy for your larger items, such as lawn chairs, a hammock, and campfire grilling utensils. The interior luxuries, such as the Everdream mattress, laundry chute, and 82" ceiling height, are sure to impress, and the two exterior speakers give you the perfect reason to gather outside underneath the awning with friends.